I did the cover, now I need fellow fakeologists to start writing the story. I figure if they can fudge the news, then so can we! Let’s me start it off. 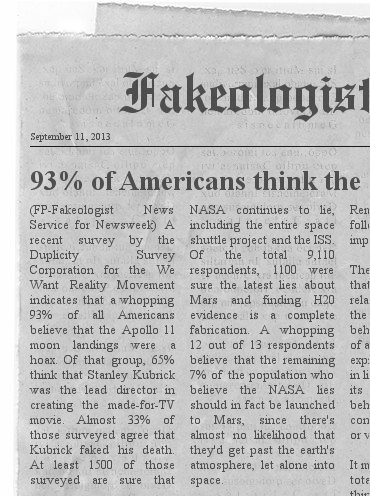 (FP-Fakeologist News Service for Newsweek) A recent survey by the Duplicity Survey Corporation for the We Want Reality Movement indicates that a whopping 93% of all Americans believe that the Apollo 11 moon landings were a hoax. Of that group, 65% think that Stanley Kubrick was the lead director in creating the made-for-TV movie. Almost 33% of those surveyed agree that Kubrick faked his death. At least 1500 of those surveyed are sure that NASA continues to lie, including the entire space shuttle project and the ISS. Of the total 9,110 respondents, 1100 were sure the latest lies about Mars and finding H20 evidence is a complete fabrication. A whopping 12 out of 13 respondents believe that the remaining 7% of the population who believe the NASA lies should in fact be launched to Mars, since there’s almost no likelihood that they’d get past the earth’s atmosphere, let alone into space. The tools are there for you fakeologists – start generating and distributing your version of the news. After all, they are! This entry was posted in Special Effects on September 27, 2013 by ab. Home › Forums › 93% think the moon landings were a hoax! ab 5 years, 6 months ago. would it be possible for Fakeologists to upload our news-creations to the site in the future ?